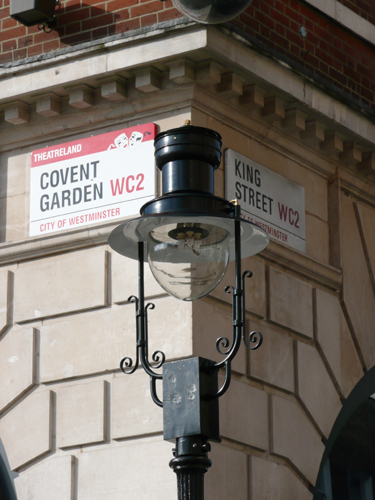 I was recently asked to examine the gas lighting columns in King Street, Covent Garden. It was thought that they had retained all their paint since their erection in 1910. Coal-gas had been used for lighting by William Murdoch, in Cornwall, Birmingham, and Manchester as early as 1792, when F. A. Winzer, a German, after several experiments, lighted the old Lyceum Theatre in 1803-1804. He also established a New Light and Heat Company, with £50,000 for further experiments. The first installation of gas lighting in Westminster was in 1807 when he lighted Carlton House Terrace. The original gas lanterns manufactured by Sugg are still today maintained, refurbished and replicated. 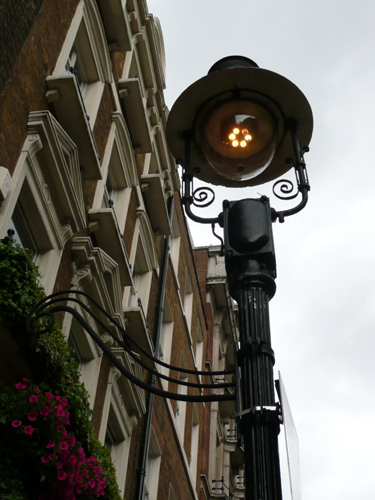 Westminster City Council has approximately 304 gas lanterns currently installed. The gas lighting columns in King Street are described as George V Eddystone columns of 1910. Each is a 5m cast iron post with a 6 light Sugg Rochester gas lantern. Having taken samples from each of the elements of the six lighting columns it was clear that no more than fourteen schemes had survived. The number and type of schemes suggested that the columns had probably been stripped shortly after the Second World War. 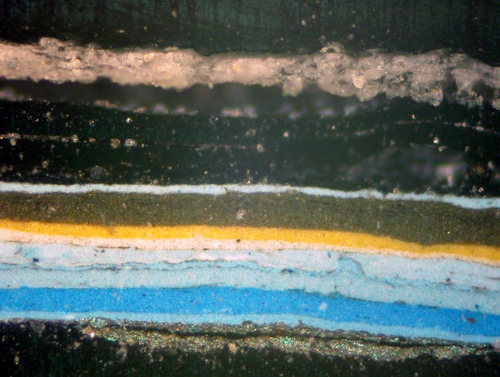 My interpretation of the surviving paint stratigraphy was helped enormously by two short film clips on the British Pathé website. The first, which was dated 1955 shows the Covent Garden Labour Dispute of that year. 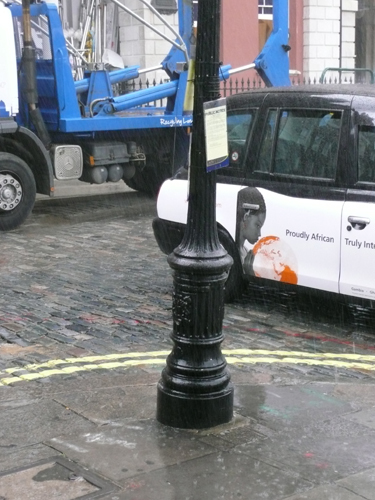 Although filmed in black and white, 25 seconds from the end of the film clip there is a shot of column EC6 on the corner of King Street and Covent Garden (see above). It appears to show the first scheme on the above cross section, which was taken from the upper fluting of that column – dark blue upper fluting, off-white torus and black column base. Certainly, it is a three-coloured scheme. Further photographic evidence is provided by another British Pathé video newsreel film, but this time in colour. This was taken in 1960 and was called May Wedding – Covent Garden. Towards the end of the film one can see a distant view of the upper section of what appears to be a blue-painted lighting column. If one accepts a date of 1955 for the first use of blue it seems likely that blue continued to about 1970. Once again, I have found that the British Pathé website has proved an invaluable aid when examining external surfaces in London. The key thing is to establish a datum. One can estimate when the last scheme was applied and one usually knows when the first might have been. However, if a date can be appended to other layers as well it is generally possible to work out the approximate repainting cycle. Nice but I want more. Perhaps a daft question: were they always painted, even in Victorian times. And I want to know more about the yellow phase, and if there wasn’t a yellow phase why I am seeing yellow. Thank you. It’s not a daft question. Yes, they were always painted. The yellow that you see relates to the black above it and it is not a decorative finish. It is a zinc chromate primer. This was introduced in the late 1940s in the UK and is often helpful with dating.